Burglaries and robberies cost businesses billions of dollars each year. Whether it’s a last-minute ‘crime of opportunity’ or a carefully planned after-hours break-in, your business suffers. Here’s the good news: you CAN protect your company. Both independent studies and historical data show that businesses with an alarm system in place are significantly less likely to experience a break-in and/or robbery. Autech goes beyond the basics to deliver smart solutions for today’s commercial interests. The last thing a thief wants is attention. They look for ‘easy targets’: that is, businesses that don’t have a security alarm in place. Autech offers a variety of security alarm products that are effective in deterring would-be thieves. From basic intrusion alarms to intrusion notification systems, Autech has the right system for every application. Our team uses the very latest security technologies and carefully selects the equipment that best suits your particular environment, ensuring reliable service in the event of any emergency. The field technicians of Autech have received extensive training in the installation of every product we use. With years of hands-on experience in configuring, installing and maintaining our systems, our professionals perform even the most complex installations expertly and efficiently. As an authorized Honeywell service provider, Autech can take you far beyond basic security alarms. With Honeywell Total Connect, Autech extends your reach by giving you on-the-go control of not only your security system but also an amazing array of functions, wherever you are. 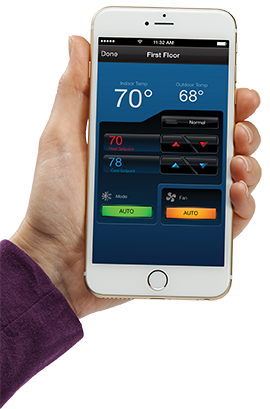 Using Honeywell’s free mobile app with your iPhone, iPad or Android device, it’s easy to stay in control, even when you’re away. And don’t worry…the Total Connect app supports Touch ID fingerprint recognition for both IOS and Android users, as well as Android’s voice command functions. You can even connect to your business without an app by using the dedicated website from your computer or any mobile device. Total Connect employs advanced technologies, integrating HD video cameras and Wi-Fi or Z-Wave automation to give you complete control wherever you go!